Now that Chanukah has begun, Festivus, Christmas, and New Year's can't be too far behind. However, before we can ring in the new year, we must close out the old one--with a bang. Or at least that's the prevailing opinion among many of us. Some of my clients have already warned me that "all bets are off" the rest of the year, primarily because of the prevalence of holiday parties. An excuse for some to cast aside the strictures of proper diet and exercise, these bacchanalian gatherings do more than simply expand our waistlines. They can “train” us to make excuses for poor dietary choices and for missing training sessions. They can also teach us to adopt the rallying cry of tortured NY Mets fans everywhere, that of “Wait Until Next Year”. 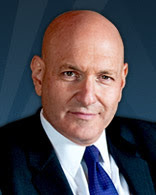 However, as Dr. Keith Ablow (pictured right) points out, New Year’s Resolutions fail miserably, and most are forgotten before the end of January. The major reason for such high failure rates, he says, is that most people neglect one key fact. We are in control of our lives! If we gain weight, or are not prepared for an event, such as the Boston Marathon, it is due to OUR choices. However, according to Dr. Ablow, overcoming hurdles and achieving our goals are not primarily due to determination. He states that we can not be successful in our resolutions until we figure out why we have avoided achieving a goal. Sometimes the reason is simple, such as having been repeatedly told, “Don’t overreach. Be happy with what you have.”, until we adopt the strategy of taking the path of least resistance. Or, the reason might be more complex. An example is someone sabotaging their own weight loss goals because they don’t feel worthy of being more fit or attractive. Whatever the reason, we must uncover it in order to be successful. January 1 will not bring with it a magic potion that wipes away the shortcomings of the previous year, while simultaneously guaranteeing success and fulfillment in the year to come. Rather, it is this difficult journey to personal truth that will determine how successful we will be from this day forward. For help getting starting on this amazing journey, check out Dr. Ablow’s "The 7: Seven Wonders that Will Change Your Life" or George H. Weinberg’s “Self Creation” today. A new and improved you awaits! In the words of Dr. Ablow, G-dspeed and good luck! For more information, please feel free to reach me at bob@bobwellsfitness.com. Self sabotage is the worst.